Last week we talked about how to find a perfect church. We gave a simple two-step process. (Check it out.) This is the opposite of what most people do when they look for a church. Most people go church shopping. Yes, I’ve done it too. When we go church shopping, we look for a church with the best preacher and with the most meaningful music. In doing so, we approach spirituality as a consumer. This is what a church shopper does. And it’s wrong. I disagree, but in a way he’s right. Some people want a church with powerful sermons. They may want a message that will challenge them, teach them about God and the Bible, or simply tickle their ears. They put up with the first half of the service to get the good part. Some even plan to arrive late, skipping the music set that they don’t care for. Other people want a church with worship music that encourages them, uplifts them, or matches their favorite style. But they zone out during the sermon, either because they’re bored, or they don’t want to listen. Or perhaps the minister isn’t that engaging of a speaker. At various times in my life, I’ve had both motivations but never at the same time. For a long time, I thought the lecture was a real reason to go to church and the music was filler. When that objective wore thin, I switched my perspective and went for the concert at the beginning, mentally skipping the oration at the end. This approach soon wore thin too. When neither message or music seemed like enough, I began wondering why I should go to church at all. The purpose of church is to form spiritual community. We can stay home and hear a great sermon or listen to uplifting music on TV or over the internet. In most cases the sermon and worship music we can access from home is far superior to what we can obtain at our local church. So why not stay home? Because there’s value in being part of a church community. And we can’t make meaningful connections or form a spiritual community when we’re at home alone. God created us for community—with each other and with him—because he, as Trinity, exists in community. And we are made in his image. We need people in our lives. We need community. Church should provide that community. Going back to my pastor friend, I shook my head at his assessment. At that time, I tolerated both the music and the message at the church he led. I did this so I could enjoy the community before and after the official service. That, however, wasted the ninety minutes in between. 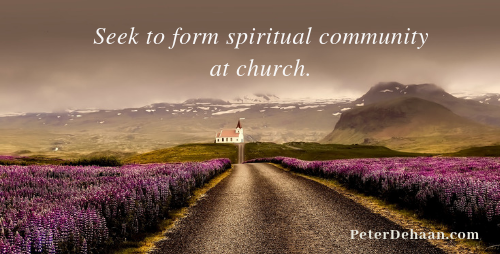 Spiritual community should be the real reason we go to church. And we shouldn’t have to go church shopping to find it.